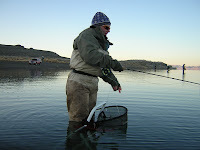 Ladders have been used by fly fisherman for some time now. One of the first articles I saw where they were employed happened to be about fishing the Monomoy flats. This picture is from Pyramid Lake. Ladders provide an obvious advantage that any guide with a poling platform will attest to - you can see better from up high. 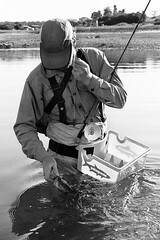 I have yet to add a ladder to my fly fishing gear but have sometimes wished one would magically appear. Have you tried climbing to success? You learn something every day. I have never seen those used before. Have climbed the ladder on South Delaney outside Walden, CO. A milk carton or step stool can also give you that little extra height. How about one of them Spray rods or Spade rods or whatever they call 'em? A 11' Switch Rod for a #7 line + a 35' shooting head or a 12' to 13' double-hander with a Guideline Power Taper and 35# Test Airflo MRM Mono or Rio Slickshooter can deliver even the largest fly to neighboring zip codes. A 12' rod has a built-in three-foot step ladder when compared to a 9' rod. And there's no way to fall off the darn thing. At least not so far. Good point. I personally expect to see a significant rise in the interest in two handed rods. I just hope the manufacturers hang in there long enough to see the sales materialize.